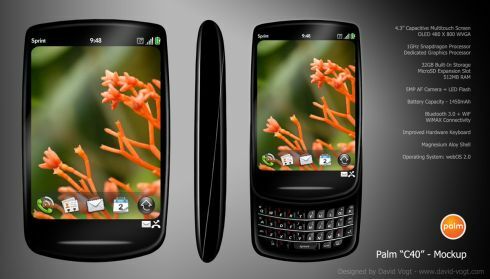 Part of the Palm Pre design competition, the Palm C40 mockup was created by David Vogt and it comes with an appealing set of specs. These include a 4.3 inch capacitive touch display (OLED 480 x 800 WVGA) and a 1GHz Snapdragon CPU. We’re not going you to bore with common features, so let’s learn more about the most interesting ones, after the break. Palm C40 supports Bluetooth 3.0, WiFi and WiMAX, it comes with an improved hardware keyboard, a magnesium alloy shell and webOS 2.0 as the choice of OS. This is like a combo between the HTC HD2 and a regular BlackBerry or Palm Pre. What do you think of this design?